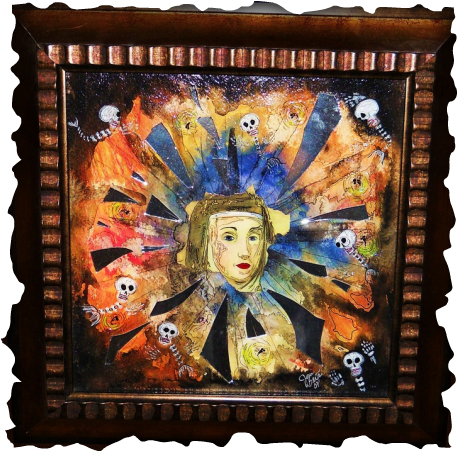 "Shattered Nun" is another mixed media work along the same theme as "Bleeding Heart". In both works I used broken mirrored glass along with acrylic, watercolor pencil & India ink to render a tie-died effect. The disembodied skulls (they are not completely disembodied as they still have spines) have grown fins, perhaps to propel them through the space surrounding the central figure. These bony 'skull-fish' swimming around the nun seem to be figments (or, fragments) of her imagination. The shards of broken mirror give an impression of an explosion, yet this image is ambiguous: the sharp edges point towards the nun rather than away from her, suggesting instead an implosion. As in "Bleeding Heart", this piece forces introspection through passive participation with the viewer: while examining the painting one sees oneself reflected in the broken glass as a 'fragmented' image. This mirrors the shattered glass surrounding the central figure of the nun.